Dreamy right?! Well so is every bag from their site!...sigh. You lucky readers - someone will get to win one of my favorite bags in your color of choice from Mimi Boutique - The Sienna Bag. 1) Visit Mimi Boutique and leave a comment with your current favorite item(s)! 2) Follow Mimi Boutique on Facebook or Twitter and let us know which! 3) Blog, Tweet, or Facebook about the giveaway and let us know! Make sure you have a website or email linked to your user id! Good luck!! Besides the gorgeous Sienna bag, my favorite is the Floria Grey Hobo. I am following Mimi Boutique on both Twitter & Facebook. ohh love me some taupe. Loving the Sienna bag in Taupe! i LOVE, love the sienna in taupe. i'm a sucker for handbags, so i also love the mercy bag in grey and the emilla bag in black. The Sienna Bag in brown is my favorite -- I think it'd manage to hold all the stuff I carry around with me day to day. I'm a follower and I love the Charlize bag - but I'm a big fan of the Sienna too! Anna--I love your style!!! I am soooo ready for a non-mommy bag! The sienna bag is perfect in brown! Love it! I SO want to win!! I need a big girl bag. I would pick the Brown Sienna bag (because Olivia P. is carrying it on the website:) AND I Facebook liked it AND I tweeted it. PICK MEEEEE! I'm too big to fit in my pretty clothes. I need a pretty bag. Love the Elsa Bag in Brown. Amazing..love the Sienna in Taupe! New spring-y color.. I'm loving the Clarinda Black Clutch with Peacock Feather. I follow Mimi Boutique on Facebook and Twitter! Oh my...the sienna is my fave. in tan. love it! I'm a follower and I love the Audrey Flower Hobo in Tan! I follow her on twitter! Ohhh I love the Sienna bag in tan. No taupe. No tan. Ummm...both. But tan. love the regina motorcycle satchel in black to be practical, but the forest green is lovely! now following mimi boutique on fb! in love! also obsessed with the donya bag (in taupe) and that sweet sweet betsy clutch in black. now following mimi boutique on fb and twitter. thanks for the great gift opp! This bag is awesome, what a great giveaway! I love the rich brown color on the bottom right. There are so many great bags on this site! These are my favorites: Paulo Envelope Clutch, Andreana Hobo Bag, Camila bag, and the Diana Satchel. What an AMAZING giveaway! I put up a tweet about it! How do you pick one thing to like?! WOW!! Well, to mention one, the Anastasia Metallic Olive Necklace is gorgeous!! So is that Sienna bag though! DROOLING!! I'm following Mimi on Twitter! And I tweeted about the giveaway! I love this bag and how Olivia is wearing it! I already have purses I love in brown and grey but the tan Sienna bag looks gorgeous! That has got to be my favorite one. these are too cute!! i would look the tan purse!!! awesome giveaway! I really like the Julian satchel in black- the headband are also really pretty! This is such a fabulous giveaway, Anna, thanks for hosting!! the petite coral earrings!! gorgeous! That handbag is gorgeous as well! Lovely giveaway Anna! I am LOVING the caterina hobo in beige. What a fantastic giveaway. Thanks Anna :) Fingers crossed on this one!! how cute!! I love the Sienna bag in beige and the Charlize in Taupe. Everything in her store is great! The Sienna bag is my favorite and most versatile bag (to me). I love the taupe- a neutral color, but a staple; however the red does make quite a statement. LOVE!! I like your blog, its very nice... why don't we follow each other? Thanks, kisses. Great giveaway, these are gorgeous bags! I really like some of the feather clips but each and every purse is fabulous! Not from the U.S. but just wanted to say what a pretty bag! The Charlize & Sienna Bags are my absolute fave -- I'm all about anything with the satchel strap, as being hands-free is the only way I can successfully sip on my coffee and do dozens of other tasks at the same time. :) Would definitely be used this next semester as a chic college student. I am fallowing on FB and posted as well! i love that sandra coral red ring. stunning! Please pop in and grab the button when you have a moe. I had to browse the jewelry section. My faves: Mckenna floral dangle earrings in hematite and I love the glamour of the Noemi pearl cluster necklace! I'm a follower on twitter! I am following on Google Friend Connect. Love the Sienna Bag in Tan. Perfect for spring, and boy do I need a new purse! My poor purse is falling apart, and this would be perfect! Fingers crossed! Following Mimi Boutique on Twitter, @ChicGiselle. Ooooh really digging the Sienna bag but also the Charlize Bag in Black! I love Mimi Boutique and the Abelia Vintage Jewelry Headband, of course the Sienna bag is awesome! I follow through Reader. Thanks so much for this awesome giveaway. I like Juliana Satchel in Croco Black. I love the leather studded cuff bracelet! ooo! I've been on the hunt for a new bag, I love the Sienna Bag in taupe! I like the Kalista Rose Print Scarf in Beige. i LOVE the Mercy bag in black. i am now following on twitter. i tweeted about it! 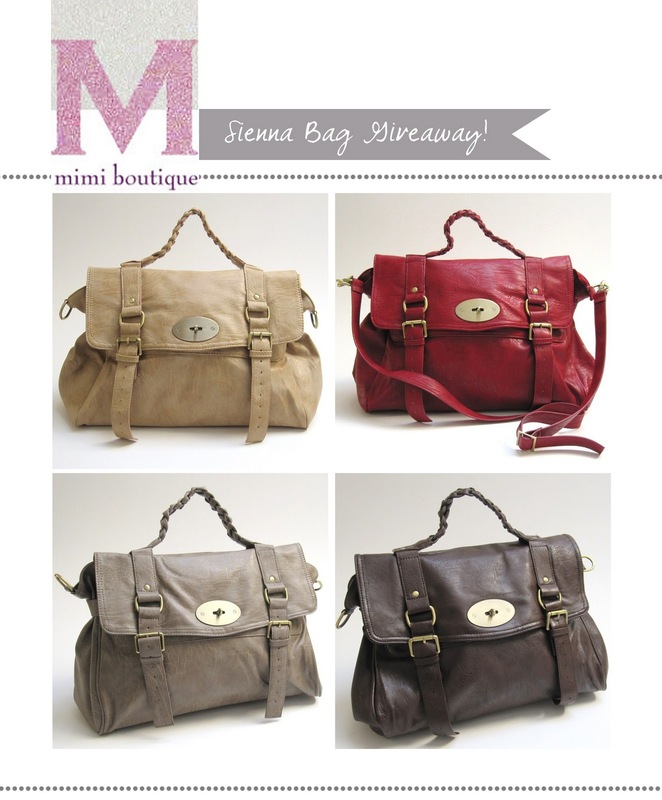 i just entered to win the sienna bag from @mimiboutique on @inhonorofdesign ' blog. beautiful giveaway!!! This is such an awesome giveaway! Besides the lovely Sienna bag, my favorite is the Mercy bag! The sienna bag is my favorite and I am in dire need of a new purse. I have not gotten a new one in about 10 years! I <3 the Sienna bag in Taupe! Want it, need it, only own one purse... and that one is camel colored. What lovely bags on the site! Great find! The Sienna Bag in Taupe is gorgeous!! I'm a follower of Mimi on Facebook! WOW! I hadn't seen their stuff before now, looks high quality and so chic! I really love the Rebecca Peacock Feather Hair Comb. I couldn't pick favorite from their bags though. I love the The Sienna Bag but I wouldn't know which color to choose. Thanks again for hosting this giveaway! Their Charday Chandelier Earrings are made of such pretty beads! I'm so in need of a good new handbag! Following Mimi Boutique on Facebook! p.s. Fan #2,065 of Mimi Boutique on Facebook! I follow Mimi boutique on Facebook and Twitter.